I've mentioned my nephew Jayden a few times. He gets to come to our house three times a week, and he and Aiden, being two months apart, are really good friends. While the girls are getting ready for school no one is allowed to watch T.V. or play video games or even play outside until they are ready (my kids are very easily distracted). Aiden and Jayden like to pass the time by playing run away from the baby (poor Dalin) or fighting. A couple of days ago as Aiden and Jayden were running through the house I hear Aiden say, "No, no Jayden you didn't know we were playing dance off fighting so we need to go practice more." Today Dalin was playing outside and he kept coming to me asking for wipes. After the fifth time I decided to see what he was up to. I found him throwing the wipes and climbing up on a stool and yelling at the birds outside. Apparently the birds were too loud for his liking. 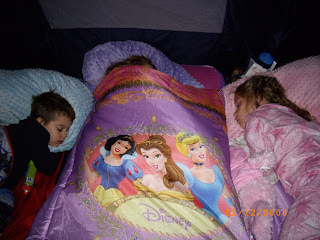 A couple of weeks ago Chris promised the kids they could set up the tent and camp out in the backyard. It rained the day they were supposed to sleep outside, so the tent was set up in the front room. We had s'mores and watched a video, and Chris thought it would be super fun to let the kids stay up as long as they wanted. I think he was hoping that they would sleep longer if they stayed up longer, and he would get to sleep in. I put Dalin to bed at ten and the other kids finally fell asleep between 12 and 12:30. The plan might have been a success except Dalin woke up at 7:30, and he made sure the other kids were quick to follow his lead. Ashton decided we needed to have pancakes for breakfast to make it a real camping experience, which is funny because she doesn't really like pancakes. They had a fun time, but I had told Chris, in not the kindest tone, that it was not a good idea to let the kids stay up so late because they would be too cranky the next day. My prediction came true. When our kids are tired they are not only cranky, but they are very weepy and whiny. It was a long day, at the end of which Chris admitted that I was probably right, and late nights were not good for our kids. Hmmm, really? We didn't get a picture with the whole tent, but here is a shot of the morning after, pre-Dalin of course. Aiden had a friend come over to play today and they decided to "go back in time to see their adult self." 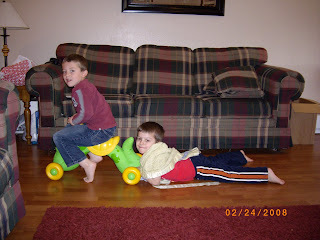 For a time machine they had one person ride on a toy while the other person would hold on to the back to be dragged across the floor. Obviously that would be the choice for a time machine. Dear, dear little Dalin. That boy is such a muckus! He loves to do things that he knows will bother his sisters and brother. Dalin loves to turn off the T.V. When we bought the T.V. I thought we wouldn't have to deal with that problem because the buttons are kind of camouflaged, at least I thought they were. Once Dalin was tall enough to see the buttons, it didn't take him long to figure out which one turned it off. A few days ago the older kids were trying to watch a show and Dalin kept turning the T.V. off. We have a tivo-like device so Kaylee would pause the show before Dalin turned it off so they wouldn't miss the show. When Dalin would notice that the show was stopped he would get mad at Kaylee and yell at her until she would play the show so he could turn it off again. Little turkey. When Chris and Aiden wrestle, Chris always tries to find a way to get Aiden to say that his Dad is the toughest/coolest man in the world. Aiden hates to say that, because he wants to be the toughest. Today Chris was wrestling Aiden and Dalin at the same time and once again Chris was trying to make Aiden say he was the greatest, and when he wouldn't Chris asked Dalin then told him to say daddy. Dalin being the phonograph he is would repeat whatever Chris told him to say no matter how much Aiden protested. Finally, unable to take the betrayal any longer, Aiden said to Dalin, "Come over to the couch, we need to talk." Those boys crack me up! My younger brother Brandon getting married next month, so under the guise of looking for dresses for the nieces to wear my mom, my sister Carmen, my sisters-in-law Danette and Natalie and I went to St. George this past Saturday to do some shopping. My grandma is there for the winter, so we met up with her and began the hunt. We went to this place called Thai Pan, a super duper home decor store. It was a really nice place, but I don't have enough decorating sense for it to be a useful place to me. The prices were really good though, and there is talk that one will be built here so if I ever get inspired then I will know where to go. We went to a wonderfully delicious place called Pizza Factory for lunch. The guy who owns it is related to Chris, and we went there when we were first dating, and on our way to our honeymoon so I've been in love with that place for a long time. After lunch we did more shopping, but I think we were five hours into our day before we actually started looking for the dresses we were there to find. We didn't find anything we liked, so as far as the dresses went the day was a bust. Everything else was fabulous. I am so glad my brothers found girls that I love to hang out with. Part of the reason I don't have alot of non-relative friends is because I have built in friends with my family. The whole day was filled with much laughter and we had a great time i am so glad I was able to go. Too bad for me and my newfound skills, I forgot my camera so I don't have any pictures to post. While I was gone, Chris took the kids to the Hannah Montanna concert movie by himself. He even took Dalin, who is reluctant to sit for any amount of time. The report I got was that Dalin really enjoyed the music so he sat for much longer than he normally would have. I am really impressed that Chris is willing to go do stuff like that with the kids. 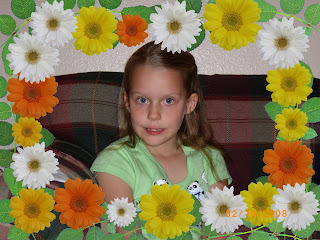 Our little Ashton turned seven last Friday the fifteenth. I feel like a terrible mother for not writing on her birthday, but it definitely does not mean I lover her any less. We had a family party on Monday and she opened presents from us on her actual birthday. She got some very cute clothes a ready bed, a spirograph, and some crazy computer things called funkeys. All in all a pretty good haul. Kaylee gets very excited about holidays and birthdays so I had to make sure to tell her that she was not allowed to wake Ashton up early. Ashton ended up waking up first anyway, but still an hour later than Kaylee had intended to set her alarm for. I took Krispy Kreme donuts for her class, and because her birthday is the day after valentines day I was able to get some heart shaped ones, so that was super fun. We sang happy birthday and had cake with cousins later in the evening. It was a very sugar filled week. We are so happy to have Ashton as a part of our family. She is genuine kindness. She is the first one to comfort Dalin when he cries, and she is always willing to jump up and help when we ask her to. She is a smart and funny girl and we just love, love her. P.S. The picture isn't the greatest quality, but I was able to post it all by myself! Woo Hoo!! We're So Glad When Daddy Comes Home! We were expecting Chris home from Salt Lake sometime Wednesday afternoon, but he tried to surprise us and he came home about 1 am Wednesday morning. His car has been reliable since we bought it but it's old, and we have never taken it out of town, so his concerned sister called me to try and talk him out of driving in the dark while he was tired and possibly in snow. I wanted him home, but I preferred an uninjured Chris over a fall-asleep-at-the-wheel or a break-down-in-the-middle of nowhere version. He made it home safely so I'm kind of glad he ignored my telling him to stay for one more night. Dalin came in our room in the morning and he saw Chris's cell phone on the table and he said, "Daddy!" It was funny that he knew Chris's phone was a sign that he was home. Chris didn't go to work on Wednesday and he was still in a euphoric state from being home or feeling guilty for being gone for a week so he agreed to go with me to do errands. It was so nice to have him with me. There is a show called "While You Were Out" where while, someone is out of town a room in their home is redecorated. I did a my own version of the show in my room while Chris was gone. I wasn't going to do anything extreme, but I painted (the last time we painted was when we moved into the house), redid the vanity and bought new bedding. I want to paint all of the furniture black so our hodgepodge will match, but I knew I wouldn't be able to finish that before Chris came home so I'll save that project for another time. I thought I could be done before Chris came home, but I should have remembered that every project I've ever done takes three times as long and costs four times more than I expect. I am close to finishing though and I'm excited because it's actually coming together nicely. I didn't have the foresight to take a before picture of the entire room, but I did get one of the vanity and I will post that and the after picture when I finish, soon I hope. On Sunday we had stake conference so we had to be to church by nine. This is a good thing because then we are not at church during Dalin's nap time, but it's not so good because there is always a frenzy of getting ready before we leave, in this case, just in the nick of time. Dalin is usually the last one to get ready because of his uncanny ability to get dirty. At one point he was trying to open a package of tights, he was being quiet, and I was able to get stuff done so I left him to it. 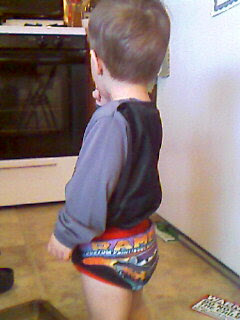 When it was his turn to get ready, he refused to put anything else on until I let him put the tights on. It has been a loooong week and I had neither the time or the energy to fight him. He was wearing a onesie shirt and pants so you couldn't even see the tights, except Aiden kept lifting up Dalin's pant leg and laughing and that made it hard for me to be very reverent. After we came home I changed his clothes and he let me take off the tights so I thought that was the end of it, but when I told the kids to get their shoes on so we could go to my parents house, he brought me the tights again saying, "socks." It was pretty funny, and one of those cherished stories we can threaten to tell to his first date. You can't really tell he has tights on, but they are there. My favorite family tradition is decorating heart shaped cakes for the family home evening before Valentines day. This year we decided to have a joint family birthday party for the three grandkids (Ashton being one of them) that have February birthdays. It was a lot of fun as always. The grand kids are getting old enough to follow in the foot steps of their parents and uncles by piling on as much frosting and candy as possible. Many cakes are hollowed out so they can fit even more candy inside. My niece Abby was sitting next to me and I kept watching as she added more and more frosting. I think she ended up with at least four inches of frosting on top of her cake. My brother Brian challenged Aiden to a contest to see who could eat their cake in the least amount of bites. I kept telling Aiden it was a trick and he didn't have to do it, but Aiden had been looking forward to cakes for the whole day so he was up to the challenge. For some reason my brothers love to see Aiden fill his mouth to capacity, and Brian wasn't even taking any bites. This morning I heard Aiden telling the story to his cousin Jayden and he said, "I don't think I want to have another contest, I think that's the reason my tummy hurt." Ya think?!? I'm glad he learned something. I didn't have my camera, so I didn't get a whole group shot of the cakes, but here is one of the cakes my kids made.